The expressions of Su Wan Er and Su Jing Ting became grim as they rushed to Old Master Su Yun Tian’s side. Su Jing Ting’s face grew solemn and very worried. Since young, he had viewed Su Yun Tian as his biological father. Everything he has now was all given to him by the old man in front of him. Su Jing Ting knew that his father was injured quite heavily. If he used his own Yuan Qi to help Su Yi recover, it would definitely aggravate the injuries. His father’s cultivation had not progressed for a very long time. If he gets injured anymore, the effects will be disastrous. He may never be able to breakthrough to the next realm. “You are also injured, furthermore, I am afraid that your cultivation is still not enough. Just protect me. Wan Er, you should leave too.” Su Yun Tian had already decided. Nothing was more important than his grandson. Su Jing Ting understood his father’s personality. Although he was unwilling in his heart, his face was solemn. He didn’t persist anymore. Su Wan Er’s eyes gazed at Su Yi who was in a coma worryingly and then followed behind Su Jing Ting out of the room. When Su Jing Ting and Su Wan Er left, the Old Master supported Su Yi into sitting while crossing his legs. After putting an elixir into Su Yi’s mouth, he also sat with his legs crossed behind Su Yi. The hand seal was completed. Su Yun Tian’s robe fluttered as Yuan Qi gushed out. Then he placed his palm lightly on Su Yi’s acupoints on his back and channeled Yuan Qi in. He exclaimed. When Yuan Qi was channeled into Su Yi’s body, he finally understood what was so special about Su Yi. He had done a check-up on Su Yi before. Though there were no significant problems, still he could not store any Yuan Qi. But now the Old Master Su Yun Tian could clearly feel how strong Su Yi’s physical body was. His tendons, bones, muscles and even skin had a huge difference when compared to a normal person. His smooth, jade-like skin was actually strong beyond comparison. Just like a mighty beast. What startled Su Yun Tian, even more, were the meridians inside Su Yi’s body. It was apparently far wider and thicker than a cultivator of the same cultivation level by who knows how many times. This implies that the circulation and gathering of Yuan Qi in his body were many times stronger than a cultivator with the same cultivation level as him. Naturally, the offensive power would also be far stronger. This should be one of the main reasons why he could fight evenly with Ji Chao. And now, the Old Master Su Yun Tian could roughly confirm that Su Yi must have experienced something in the Forest of Demons during the past three years. In comatose condition, Su Yi felt as if his entire body was being enveloped by warm currents. He could feel indescribable comfort. And in his mind, it seemed like there was a lot of information being transferred to it at once, flooding his mind. Night. The moon and the stars glimmered brilliantly in contrast to the dull and dark firmament. Liu Estate. A peaceful yard. This was where the experts of Sacred Mountain had been resting. No one dared to come over and disturb them. On the bed, Ji Chao sat crossed legged, his breathing faint and his face deathly pale. The weakened Ji Chao’s right hand was covered with bandages and soaked with blood. That was the injury caused by Su Yi’s fist. It had nearly crushed his bone completely. Ji Chao’s heart was filled with dread as he recalled the aura of Su Yi’s final punch during the day. The aura which burst out of Su Yi at the end was sharp and tyrannical, imposing and destructive. It made his heart palpitate with fear. he had never felt such a horrifying aura before. “Indeed, it is very bizarre. He’s in Yuan Soul Realm First Grade, how could he fight evenly with you.” Wang Quan De was deep in thought. “Granduncle, is that brat dead yet? If not, we must absolutely reject that engagement. A disciple of Sacred Mountain is not someone he is worthy of.” Ji Chao told Wang Quan De. On his pale white face, a cold killing intent was still visible in his eyes. Even until now, Ji Chao could not imagine, a trash with the talent of an errand boy could actually make him pay such a heavy price. If this matter traveled back to the Sacred Mountain, he would become the laughing-stock there. “Granduncle, if we bring that brat back to Sacred Mountain, wouldn’t it be even more troublesome then?” Ji Chao was confused. He did not understand what his granduncle was planning. “What do you know? At that time I will have my own arrangements for him. Honestly, I hope that kid doesn’t die. This is an opportunity for me, Wang Quan De. 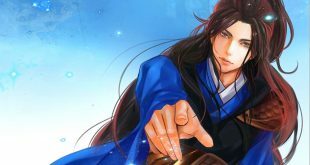 If I can improve a bit more, then with my relationship with the Clan, I can easily become a Dharma Protector of the Inner Mountain!” Wang Quan De said, his voice deep. Anticipation filled his eyes and so did a cold light. The first blush of the day came. Misty Fog rose in between the dark blue mountain peaks. The green mountain tops looked like a scene straight out of a painting. As the red sun rose, the remaining fog which had not dissipated, shrouded the mountains like a faint yarn blanket. The green mountains far away were arranged in rows, like the rising waves of an ocean, towering and strong, grandiose and beautiful. On a mountaintop, there was a graceful figure so beautiful that even moon would shy away from her beauty. Her lotus-like hands twisted and turned the hilt of the sword. Light reflected off the precious sword in her hands as it turned together with the swaying of her exquisite figure. This graceful figure had red, fiery clothes. Her body was slender and graceful as a swallow, accompanied by the whooshing sounds of the air splitting. The precious sword moved as quick as lightning. The light reflected by the sword flashed, and together with the greenery in the surroundings and the fire-like clothes, it was like a scene from the fairyland. Gradually, the precious sword in the lady’s hand turned faster and faster, swirling all the fallen petals and broken rocks on the ground into the air. A faint dainty smell of flowers drifted through the air as the broken rocks formed a storm. At this moment, the sword in the hands of the lady in red clothes seemed to be flickering like the white tongue of a snake, yet it also seemed like a dragon soaring into the sky. Sometimes, as graceful and gentle as a swallow, while the other times as fast as lightning. If someone were to be present, their jaws would be wide agape seeing such a young lady having such skills. Even in this world, it would be as rare as the feathers of a phoenix or horns of a qilin.